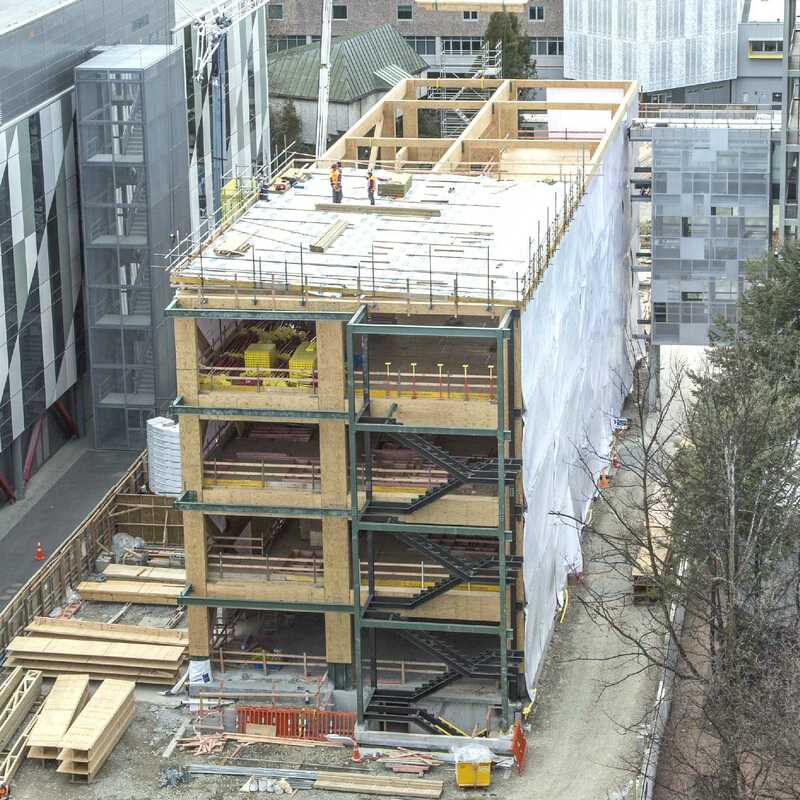 This four storey all timber framed building is scheduled to be completed in 2019 and will house College of Science staff and faculty postgraduate students on campus at the University of Canterbury. The unique building construction design pushes traditional boundaries of multi storey timber frame technology and was developed at the University of Canterbury in 2004 - 2005. The building system incorporates Laminated Veneer Lumber (LVL) technology and this will be the first multi-storey, all timber moment-framed, cross braced building in New Zealand. A moment-frame is a two-dimensional series of interconnected construction elements which relies on rigid connections. The methodology involves threading and post-tensioning steel cables horizontally and vertically into a multi-story frame. The design provides resistance to lateral and twisting forces and allow for significant building movement in the event of earthquake etc. The steel cabling system could also potentially be utilised to restore a structure to shape in the event of movement as a consequence of earthquake. The first building in the world employing this construction discipline was the Arts Building at the Nelson Marlborough Institute of Technology in New Zealand. Other New Zealand projects using the technology include the College of Creative Arts at Massey University's Wellington campus and several buildings forming part of Christchurch's post-earthquakes rebuild program. LVL technology is being taught to University of Canterbury engineering students which should have particular future application in Christchurch's ongoing earthquake sensitive environment. The building is to be known as the Beatrice Tinsley Building. Dr Tinsley is an alumna of the University of Canterbury having graduated with an Msc in Physics with First Class Honours in 1961. In 1966 she completed a PhD at the University of Texas in only two years with marks of 99% and 100%. Her thesis discussed the Evolution of Galaxies and its Significance for Cosmology and her dissitation was described as extraordinary and profound by her then professors. Sadly, she died in 1981 aged fourty as a consequence of a melanoma cancer. Her academic achievements were formally recognised by New Zealand in 2011 when the New Zealand Geographic Board named a mountain in her honour. Mount Tinsley rises to 1537 meters in New Zealand's Kepler Mountains in Fiordland, 15km west of Te Anau.